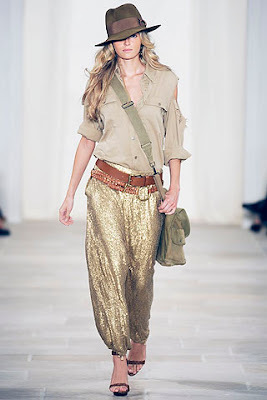 Harem, Jodhpurs, seem to be a trend that is not going anywhere soon. 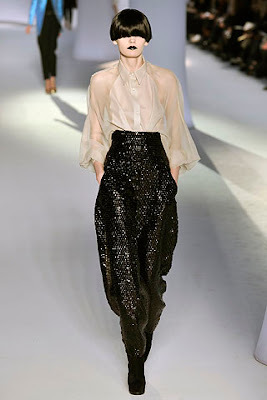 It was featured in fall 2008 and spring 2009 runways--and am lovely these pants. What do you think? Would you be caught wearing it or are you addicted to it already? Your pants are insane. I LOVE 'EM, babe! I want to see BRITNEY on tour too, my aunt's bff works for Jive and closely with Britney (he's in the Stages DVD!) hopefully he can score me something?? i can't picture myself in them, but you look sooooo good in yours! you're working those harlem pants! and that checkered tanktop is amazing!! Anyway your outfit is sooooo amazing! Impecable (sp) really! Those jodhpurs are spectacular, and you pull them off so well! I really like jodhpurs, they've grown on me, and I recently bought a pair of trousers, quite similar, though kind of different... if that makes any sense! haha. I love emmanuelle alt on the last picture! Your pants are also amazing! those pants really are amazing! those pants look great on you.. and LOVE LOVE LOVE the shoes!! love your pants. i find them to be super comfy which makes you want to wear them more. fabulous shoes! are they true to size? i'm thinking of ordering some online. @roxanne: thanks a lot girl!! @deep in vogue: thanks hun!! @SC: coming to catch up on your lovely posting... thank dear. am such a big fan of destinys child. i was watching the video for "no,no"--bring great memories!!! @nina: thnks, they are soooo comfy!! @Marta: you should try a pair, i love it...thanks!! @Thanks Kay! i actually ordered half size--got size 9.5 instead of 10. fits great!!! ohhh, i love the JS shoes, you look great, i bought them but my feet are too wide and my arch was off, so sad cuz they are so fabulous!!! This YSL collection is awesome! hey S,you look hot darling!I like Harem pants,think its all about how its worn. love you in that mustard jacket,you rock honey. LOVE em, you look wonderful dear!! Haha I'm defo a fan, I wear mine pretty often because of how comfortable they are! you pull off those pants soo well! you look awesome! luv how you rocked those jodhpurs! ooooh you look fantastic in harem pants!!! i LOVE the harem pants they're so uniquely shaped!! something different from the usual skinnies! @Charmaine: totally different from skinnies and really comfy. thanks!! That's it... I'm coming to steal those insanely lustful pants!!! I wouldn't be caught wearing these women's pants, but you look good in yours. I just don't like the ones that hang so low. They don't look comfortable. The Balmain version is beautiful!